All the participants on the 40th edition of the Spes Unica retreat sponsored by Holy Cross College campus ministry. The retreat started 20 years ago and has taken place twice a year since. 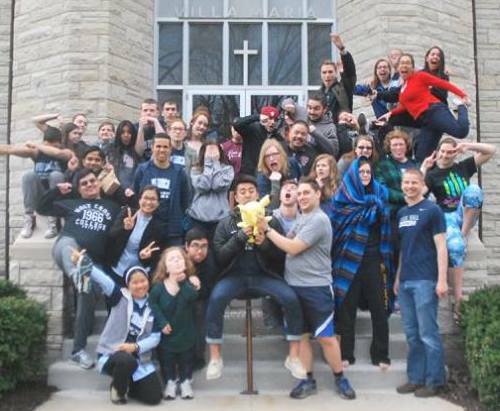 The retreat was a great time to spend a weekend off campus and to build community. More importantly, it was a time for spiritual renewal and reflection with the opportunity to receive the sacrament of reconciliation, as well as spend time praying in Eucharistic adoration. Members of St. Joseph House who participated in the retreat included Bro. Chris, Bro. Jony, Dustin, Andrew and myself. Bro. Jony gave a great presentation to all the retreatants about his country, Bangladesh, and the work of the Congregation of Holy Cross there. The retreat was a fruitful experience for which we are grateful.